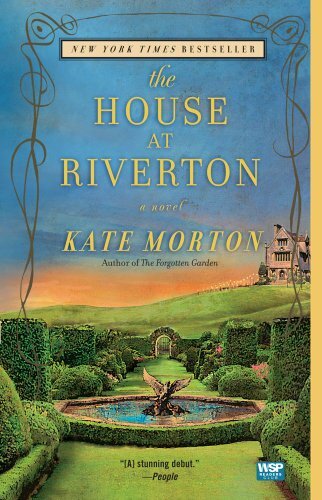 I’m sure many of you have already read Kate Morton’s debut novel, The House at Riverton, but I only just finished it yesterday afternoon. If you haven’t already found a book to while away the dog day’s of summer, might I suggest you run to your bookstore immediately and purchase this one. Whew. What a read! Grace Bradley is fourteen years old when she comes to Riverton House to work. Her mother had also worked at the sprawling Essex manor house, but had to leave under mysterious circumstances. It is through Grace that we learn of Riverton and its inhabitants. I have been thinking about the day I started at Riverton. I can see it clearly. The intervening years concertina and it is June 1914. I am fourteen again: naive, gauche. terrified, following Nancy up flight after flight of scrubbed elm stairs. Her skirt swishes efficiently with every step, each swish an indictment of my own inexperience. The story, though, starts in the present. Grace is an old woman now. Her husband is dead; her daughter is in her sixties and her beloved grandson, Marcus, has been missing for several weeks. When a filmmaker from America writes to ask if Grace would consult on a film she’s making about a tragedy at Riverton, Grace is pulled back into her memories. Fans of Downton Abbey will be able to picture Grace’s life perfectly: the servants downstairs, their dedication to service, their hierarchy. But Grace is more concerned with the Hartford siblings: David, Hannah and Emmeline. Over the years she becomes particularly close to Hannah and when Hannah marries, she is whisked off to London to live. The House at Riverton is about an aristocratic family in decline. Set between the two great wars, characters go off to their deaths, or come home damaged. The Roaring Twenties usher in an era of shifting sensibilities. Morton does a spectacular job of evoking a time and place. It’s easy to sympathize with the female characters who yearn for a different life and although criticism has been leveled at Grace for choosing service over personal happiness, I believe I understand her choice. Because Grace is looking back, the reader knows early on that some tragedy has befallen the Hartford family. That alone would be enough to turn the pages. But the novel takes its time arriving at its conclusion. Perhaps some readers found the novel slow and the prose over-written; I know it took me a while to settle into the story. However, when I left Grace, 468 pages later, it was with great sadness because even though this is the story of Riverton, Grace’s own story is inextricably linked. This entry was posted in Book Chat and tagged 2012, Book Review, highly recommended, literary fiction, popular fiction by Christie. Bookmark the permalink. Bring it with you next week, please. It sounds like my kind of book!